Starwood SPG App Will Be Deactivated On 13 February 2019, Requiring To Download Marriott Application! The SPG App is now displaying a warning notice upon login that it will be discontinued on February 13 when Marriott’s new BonVoy program goes live. Customers who wish to use the app functionality for their Marriott accounts will have to download their app in order to use that one instead. 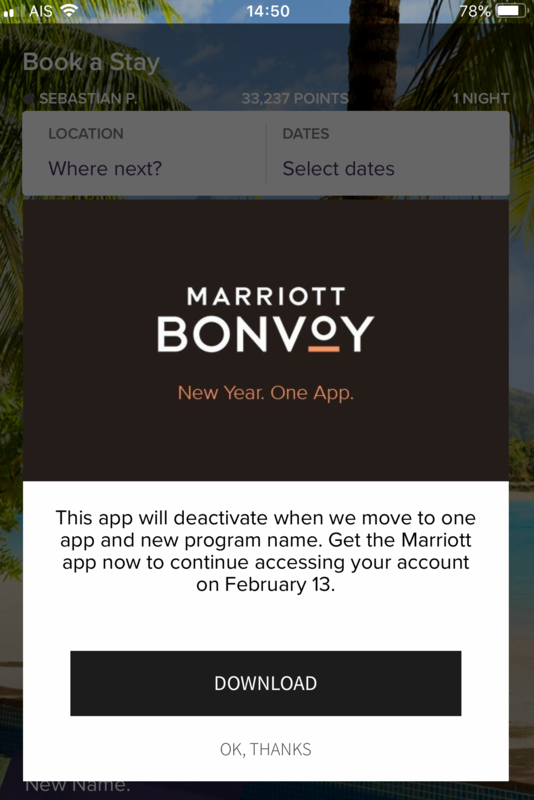 Marriott has already announced two days ago that their new BonVoy Program will go into affect on February 13th 2019 so this date will be the same when the SPG App will cease to function (and the SPG web surface likely as well). I also contacted SPG this week and asked when we – the members – will finally see our status for 2019 adjusted and given credit towards the lifetime status. The answer was “sometime in January”. Well it’s already the 18th of January so they better speed up. It was to be expected that Marriott would at some point pull the plug on the SPG interface. It’s probably a convenient date for them to squeeze everything together. Let’s hope that February 13 won’t go down in infamy while Marriott continues their destructive part of merging and shutting down parts of their loyalty brands.